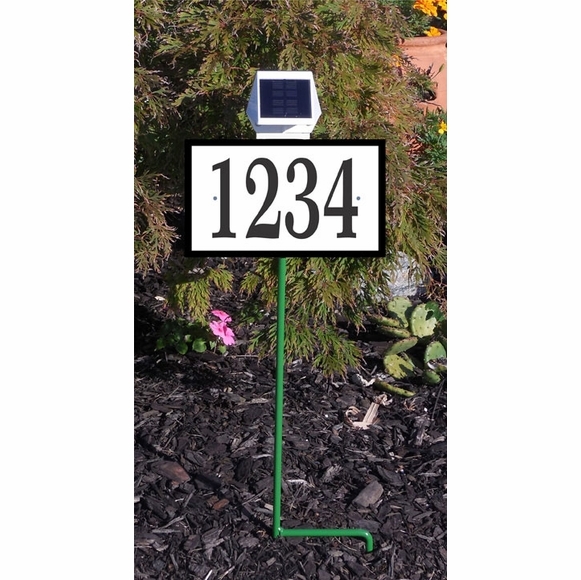 Solar Illuminated Lawn Mount Address Sign - - three-piece solar light address system consists of a personalized 10" x 6" x 1/8" rectangle house number sign with solar bracket extension, solar light, and 24" black lawn stake (green stake in main photo is no longer available). Fast turnaround; ships in 1-2 days. Personalized house number plaque holds up to five numbers or letters. Sign made in USA. Sturdy and UV-stabilized laminated 1/8" thick acrylic construction with engraved numbers. Withstands temperatures to 175-degrees F without deformation. Color: white with black characters. Black border accentuates the rectangle shape. Overall dimensions with solar light: 10"W x 9.25"H.
1-year mfg. warranty on sign. The included solar light illuminates for up to 12 hours per night. Two high-output LEDs produce brilliant white light. Runs on one long life AA Ni-Mh rechargeable battery (included). 3.5" x 3". 2-year mfg. warranty on light. Address Sign Lawn Stake is constructed of solid steel. Sign made in USA. Total height of assembly is 29.25", and stake inserts approximately 6" into the ground. Includes a slotted mounting plate and two stainless steel bolts with lock nuts. All parts and stainless steel bolts and locknuts supplied. Some clients refer to this item as our solar powered address sign. It�s exactly what I wanted since we live on a street without street lights and it�s very difficult to find house numbers in the dark .. and since we are �seniors� .. especially important if any emergency help is needed..
It�s been a pleasure ! !